Located at Punta della Sabia, right on Elli beach, La Ronda is the result of a project elaborated during the Italian rule with the purpose of boosting the hotel and other trade activities existing in the area. It was built during 1933-1936 and was meant to harbour a modern hub of tourist entertainment, novel for its time, which explains its unique structure, design and projected operation. More about Rhodes sightseeing? Rhodes town. Italian architect Armando Bernabiti wanted to contribute to the creation of a pleasant and tasteful ambience for the visitor and so combined the existence of the mid-water diving board with a notworthy bulding which would house bathing-related facilities and a snack bar. And he even went much further than that: he created a statement of eclectic style, typical of the bon viveur era of the 1930s, but also featuring oriental details to combine the best of both worlds present in Rhodes: the West and the East. 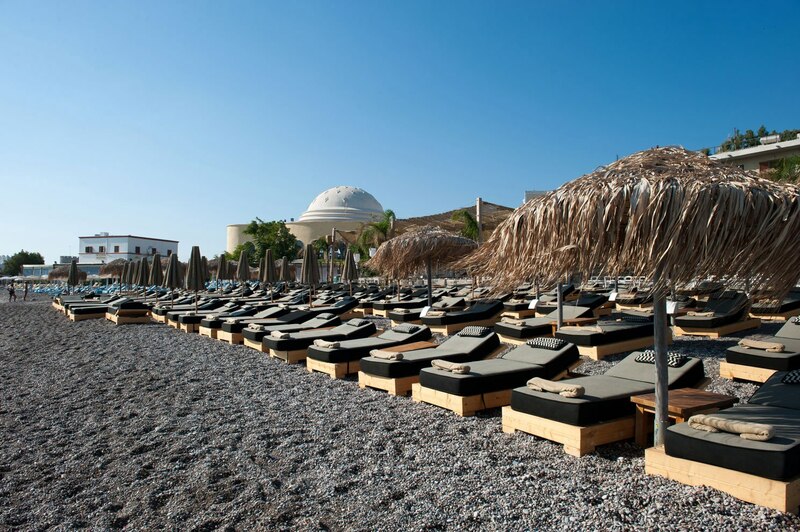 La Ronda is located on one of Rhodes' most popular beaches, Elli. Just minutes away from the Medieval Town, at the northern part of city, Elli beach welcomes thousands of visitors every year who enjoy the crystal clear blue sea and the velvet sand. According to British author Laurence Durrel who spent a couple of years living on a house on Elli beach, this is the most beautiful strech of beach in the whole of Mediterranean! It certainly is a favorite among photographers, professionals and amateurs, since it is the most photographed beach of the Dodecanese – to say the least. Built right on Elli beach, La Ronda soon came to be known back in the day as the most impressive example of bathing facilities accross the Aegean sea. Its characteristic round design, perfectly adjusted to the surrounding area, gave it its name (ronda meaning circular, round in Italian) as well as a striking appeal, with its main circular hall crowned by arched windows and topped by a vaulted roof with an impressive skyline. The ground floor was used for vessel storage: canoes, boats, sails and other relative equipment were stored here. The kitchen and cloth press were also situated in the ground floor, which was connected to the upper floors via an internal staircase. Lockers and changing facilities could be found both on the ground and upper floors of the north wing. During the course of its history La Ronda was also used by the Italians as a welcoming and medical examination centre for the island's visitors or permant residency hopefuls. After the Dodecanese annexation to the united Hellenic state, La Ronda's main building was converted into an officers' club for the crew of the USS “Courier”, a historic ship on board which the “Voices of America” radio show used to broadcast all over the world. During that time, the upper floor was completely separated from the ground floor, a separation that remained for the years that followed, when La Ronda housed night clubs, dance venues and bars in sequence. Recognizing the building's long history and its architectural and cultural significance for Rhodes, the Greek Ministry of Culture declared La Ronda as a national monument in 1987. Today, after an impressive restoration, the place maintains its status as a meeting point on Elli beach, offering quality food, drink and plenty more entertainment sea-related (or not) entertainment facilities, all with an impressive view of the Aegean and the surrounding area. La Ronda's contemporary visitors may enjoy their time on Elli beach, streched out on a comfortable chaise longue at the establishment's beach bar. A selection of breakfast choices, fruit salads, snacks and frozen coffees are offered here throughout the day and, after the sun begins to descent, the music beat turns up, unique summer cocktails are on offer and the atmosphere turns into party mode. If you want to have a delicious meal by the sea, then you should definitely visit La Ronda's restaurant which offers fresh fish and sea food fished out daily by local fishermen. A great variety of sushi is also available, with maki, nigiri and California rolls figuring at the top of the menu. All dishes may be accompanied by a wide selection of Greek and European wines. The place also provides quality yachting services. La Ronda plays host to many noteworthy events, public or private, throughout the year, so be on the look-out for its many spectactular nights or contact the Ronda team to arrange a private affair. 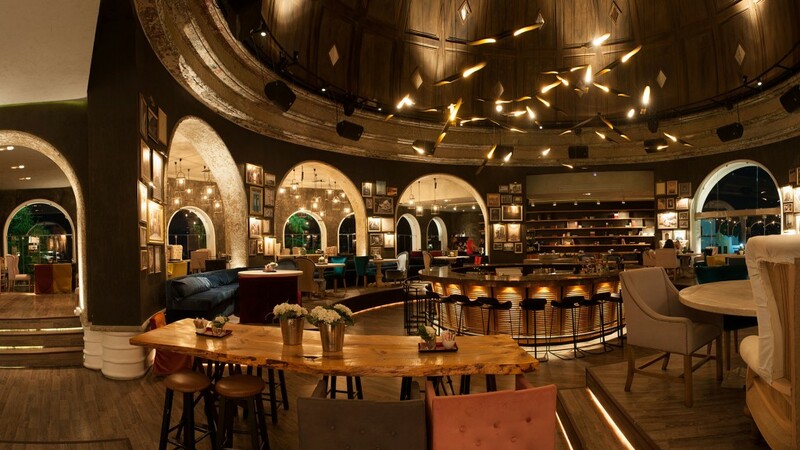 The place is operated by the same people who have been running the Soho Bar, the definite leader of Old Town's night life for the past decate, so they sure know how to party! Taking the lead from its innovative past and leading Rhode's high quality entertainment industry to a new and elevated future, La Ronda remains an elegant and delightful spot that will not disappoint at any hour of the day.